These cookies are very similar to those found at Espresso House shops all through Sweden in December. 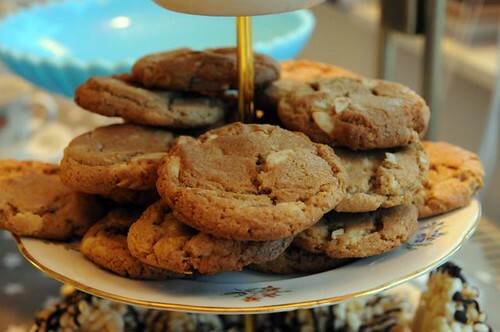 A chewy cookie, slightly spicy, with chunks of white chocolate and almonds. Mix the butter with the two sugars until combined. Add the egg and egg yolk and mix again. Stir in flour, salt, spices and baking soda, and mix until it's just combined. Finally add the chocolate and almonds, and mix again. And as always, I heartily recommend freezing the scooped-out cookie dough, and then baking from frozen. You might need an extra minute or two in the oven.